Broad neck aneurysms are more difficult to treat with the traditional coiling technique. Debrun et al. 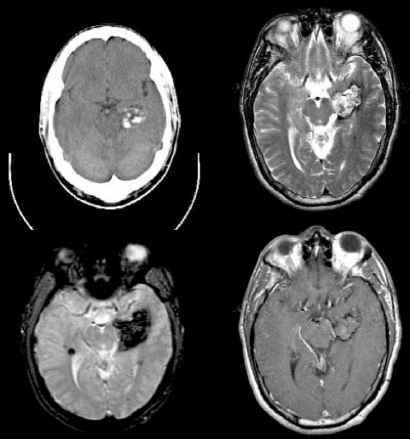 (52) reported an 80% total occlusion rate in aneurysms with a dome-to-neck ratio of 2 or larger and only 58% for a dome-to-neck ratio of less than 2. 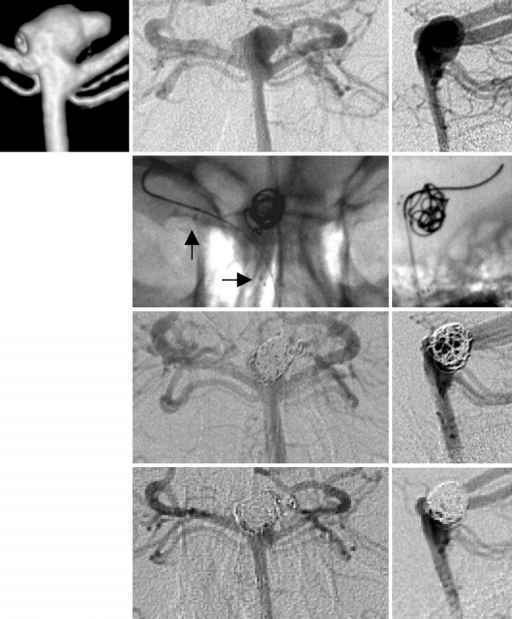 A variety of devices and adjunct techniques have been developed to allow successful endovascular treatment of aneurysms that are otherwise difficult or impossible to treat. 3DA is key to define the aneurysm geometry and thereby choose an appropriate treatment option. (Fig. 4). It involves the placement of a second microcatheter with a microballoon tip placed across the aneurysm orifice. Coil delivery is performed while the balloon is temporarily inflated. The balloon is then deflated, and the coil stability is assessed prior to coil detachment. The support of the balloon helps retain the coils within the aneurysm and allows for denser coil packing by compressing the coil meshwork. Potential risks are associated with balloon inflation in the intracranial arteries. There is an increased risk for thromboembolism owing to the use of a second microcatheter (67). Ischemia from prolonged vascular occlusion can also complicate the procedure. 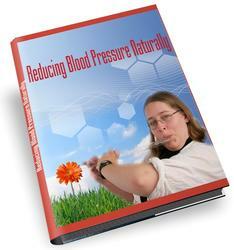 Therefore, care should be taken to minimize the duration of the flow occlusion. Rupture of the parent vessel can be caused by overinflation of the balloon. Sealing of the aneurysm with the inflated balloon during continuous flushing of the microcatheter can potentially increase the tensile stress in the aneurysm wall. To minimize the aneurysm rupture risk, the distal inflow zone can be left open while the proximal inflow zone is sealed. Alternatively, the balloon is incompletely inflated or the microcatheter flushing is temporarily discontinued (68). The technique involves deployment of a stent across the aneurysm neck prior to the placement of coils into the aneurysm. The placement of an endovascular stent across the aneurysm neck can act as a scaffold to prevent coil herniation into the parent vessel (69,70) (Fig. 5). Unlike the temporary coil support provided by the balloon remodeling technique, the intravascular stent provides permanent support to the coil mesh. Aneurysms may also spontaneously thrombose following stent placement only, even without GDC packing (71-73). The stent mesh probably causes alterations in the flow in the aneurysmal lumen that induce gradual thrombosis. Less porous stents could provide tighter aneurysmal coil packing. This has to be weighed against an increased risk for side branch obstruction. Antithrombotic medication is necessary following stent deployment to prevent stent thrombosis and distal emboli. Stents induce neointimal proliferation, which may result in hemodynamically significant stenosis. Heparin-coated stents have been tested in animals and showed decreased proliferative changes (74). Another limitation of stent placement is the potential for occlusion of the ostia of side branches, resulting in infarction. This, however is rarely encountered. Experimental evidence in dogs showed that side branches remain patent if less than 50% of their ostia are covered by the stent struts (75). Further improvements in stent design are expected to facilitate navigation in the intracranial vessels. Our initial experience with a new flexible intravascular tured aneurysm, heparin is given intravenously throughout the procedure to help decrease the risk of emboli; for a ruptured aneurysm, it is given once the rupture site is felt to be secure usually after two or three coils have been placed. The bottom panels show the final angiogram after placement of an additional 24 coils. On the lateral view note that the density of the newly placed coils is higher than the previously placed coils even after compaction. stent, specifically designed for the intracranial vasculature (Neuroform stent, Boston Scientific) has been very encouraging. 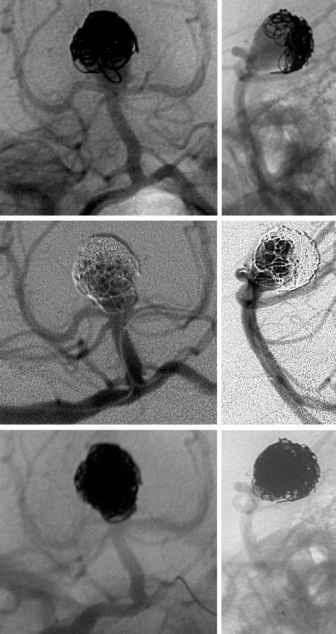 3D-GDC is designed for endovascular treatment of wide-neck aneurysms. It is made of large and small loops that alternate at 90° angles. After deployment, the coil assumes a 3D spherical shape, with coil loops bridging the aneurysm neck. It is used as the first coil to form the basket multiplanar framework (76). It can be used in conjunction with balloon and stent assist techniques (Figs. 4 and 5). The 3D- GDCs are more rigid than the standard GDCs; therefore they should be used with caution in small aneurysms and in acutely ruptured aneurysms. The Trispan device (Target Therapeutics) is a new tool designed for treatment of wide-neck aneurysms. It consists of three nitinol loops that form a scaffold at the ostium. The disadvantage of this technique is the need to use two micro-catheters (77). The device is not available in the United States.